Please pop by and see what the lovely and super talented Jessica and the DT have made! I made a couple of shaker cards to share today! I used some Dina Wakley Cotton Watercolor Paper and a Stitched Rectangle Die for the base and then colored with Broken China and Peeled Paint Distress Oxide Inks. 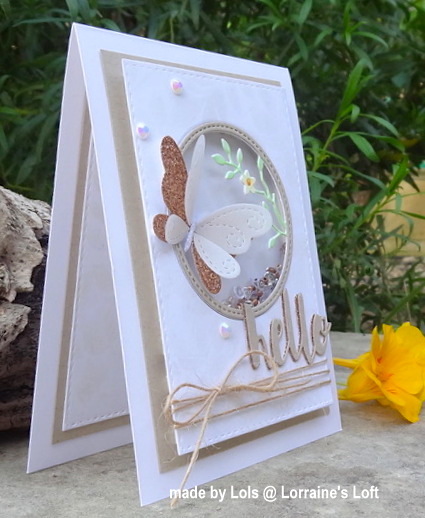 I then embossed using a gorgeous Tim Holtz 3D botanical Textire faded Embossing Folder, WOW!! so pretty! I spritzed and splattered with water and when it was dry I used my fingertip and Pearl Lustre Gilding Wax to highlight the raised areas, beautifully shimmery. I smooshed some Worn Lipstick, Squeezed Lemonade and Spiced Marmalade Distress Oxide inks onto watercolor paper and die cut the beautiful butterfly. I used the negative as a stencil to outline on vellum for underneath the wings. 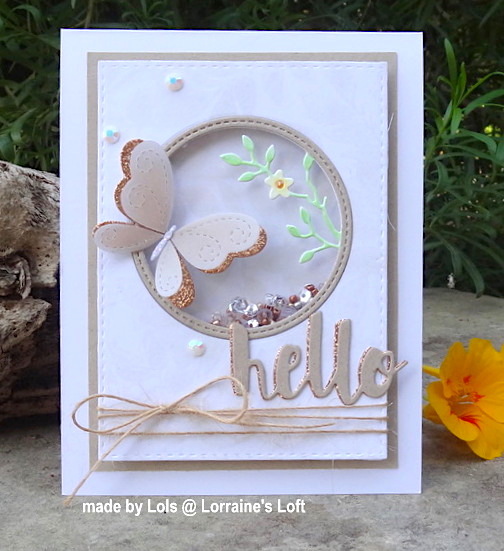 My 2nd card is more CAS using White and Kraft card stock. So now it's YOUR turn to frame something!